Intrepid Lutherans: All in favor, say "Yep!" The Brothers of John the Steadfast have posted this comment by WELS President Mark Schroeder and are making arrangements for this most official summit. If you would like to see such a summit take place, say "Yep!" Issues, Etc. host Todd Wilken has hosted President Scrhoeder on the show and has done Lutheranism a big favor by providing a means for confessionalism in the LCMS and the WELS to hear each other. Schroeder’s Banjo/guitar gesture suggests that there will be a healthy interaction on the highest administrative levels between the two orthodox Lutheran bodies. The LCMS is a two-million member denomination head-quartered in St. Louis and is the largest Lutheran denomination in America. 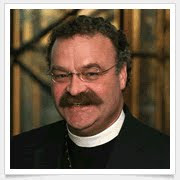 The Evangelical Lutheran Church in America (ELCA) is the largest Lutheran body by name but with their recent votes against the Bible’s teaching on sexuality it is accurate to say that they bring shame to the name of our beloved church father Martin and ought not to be considered Lutheran. The WELS asserts on their website that they are the third largest Lutheran body in America but by our count, dismissing the ELCA as Lutheran, our buddy, President Schroeder can consider the WELS to be the second largest Lutheran body on the continent with nearly 400,000 baptized members. But of course the Lord does not focus on numbers. He focusses on faithfulness and so the real question to ask is this: “Is your denomination faithful to the Scriptures and the Confessions?’ For the most part the WELS and LCMS are faithful and so are other smaller bodies such as the Evangelical Lutheran Synod (ELS), Lutheran Church – Canada (LC-C), the Evangelical Lutheran Church of Haiti, the Church of the Lutheran Confessions (CLC), the United Lutheran Mission Association (ULMA), ELDONA, etc. Surfing the WELS website I was reminded that both the WELS and the LCMS have large parochial school systems. Our Concordias have certainly done their fair share of turning out undesirable “church growth” church workers but overall, our schools have contributed to confessional strength in Lutheranism and ought to be supported. Yes mam! Oh, and Pastor Tomczak, do you have any new books that I may borrow? Funny, I was not aware that the to Synod SP's were gifted instrumentalists. Anonymous comments not allowed! (oops I forgot) I have a question. The CLC! A confessional church body? ELDONA! Could Pastor Rydecki or Pastor Spencer offer some guidance on this issue. Pastor Spencer may be aware of my "connection" with one of the mentioned churches, but I am asking to keep such "connection" off of Intrepid. Thank You. I'll poke around and see if I have anything intriguing to send home with your pastor at circuit next week. Haha that would be something. "Yep" from me. Having had no contact with anyone from the CLC, I can only go on what I've heard and read about them. The last I heard (over ten years ago now) is that the WELS and CLC doctrinal committees met together and found no fundamental disagreement in doctrine. Yet, the CLC still maintained that they could not restore ties with WELS "for doctrinal reasons." Somewhat baffling. Of course, it was because WELS was one year slower than they were in leaving the Synodical Conference that they broke fellowship with WELS. I think they still want WELS to admit that they should've left the Synodical Conference earlier. Their website claims that their difference with WELS/ELS is that WELS/ELS are willing to continue admonishing what they see as false teaching in another church body until it becomes clear that the other church body is hardened in their position (my paraphrase). For their part, the CLC seems to believe that after a single admonition, if the matter is not entirely resolved, then one church body must break away from the other immediately. "Mark (once) and avoid." That's all I can offer at the moment. Most church bodies in the world believe the WELS to be too strict on church fellowship. The CLC is the one church body I know of that believes the WELS to be not strict enough on this doctrine. A long time ago I asked my uncle about the CLC (he teaches at their College) and he basically told me what you just said. He also added for a basis of division the relationship that WELS has with AAL/Thrivent (a relationship that is fostered at the Seminary through the "gifts" we get), but I was unsure if this was a personal or synodical position against WELS practice. I have to admit, I agree with him on the Thrivent thing (ie, that we should not be fostering, catering or jumping through hoops for them for their money. Better yet, with their current practices, we should mark and avoid Thrivent). Regarding the whole Schroeder/Harrison fun. . . Not to be a killjoy, but I just want to throw out the question, "Couldn't such a summit be construed as "fellowship" to a certain degree? Those who don't know the history or reason we are not in fellowship with each other could get the impression, "Here are two confessional Lutheran leaders, having fun. Both hold to the Lutheran Confessions. Maybe these two synods are closer in confession than we think? Maybe the differences are minor?" We have to remember that these are synodical leaders. What they do publically will send a message, even if it was meant in fun. Better than a Banjo summit, how about formal doctrinal talks between the two leaders - to see if doctrinal agreement fellowship can be reached. Don't get me wrong: I thank God for the things Concordia publishes and that many in the LCMS are doing. God is working with his Gospel through her, and I praise him for the confessional renaissance that seems to be happening. I pray that the LCMS and WELS could once again be restored to doctrinal unity. But unless certain doctrines and practices are changed, the LCMS is still a heterodox Church. If this were not the case, we would be in full fellowship with them, would we not? The problems that divided us in the 60's have not been addressed. As much as I would love to see a "Banjo" event - and maybe my reservations are all wet - I wonder if such an event is appropiate given the divisions that still exist. Let us address them first (and maybe we are - for all I know) and then let the true fun begin. I would be perfectly happy if the synod would cut all ties to Thrivent. This is becoming increasingly clear. As to the summit, I think Pres. Schroeder's suggestion was not to set aside differences in order to have fun, but rather a light-hearted way of saying that he would like for serious discussions to begin between our church bodies, and that he is willing to approach such a discussion in humility and Christian love - not apologizing for standing on the truth, but not arrogantly assuming that Missouri is today where she was 50 years ago, and that "we're right, they're wrong, period." There are a variety of positions in Missouri. Some congregations and pastors hold to thoroughly orthodox positions. Others hold to heterodox positions. The same could be said of our church body, no doubt, or else we would no longer be in the Church Militant. The question is, where will the synod officially come down on these positions, and will any attempts be made to discipline those who err? I am hopeful that Pres. Harrison will come down on the right side of doctrine and practice, and will have the courage to begin to deal with the variances in the LCMS. Where will Missouri come down on these matters? Do we still have any fundamental disagreements with them? Where has WELS erred in the past, and do we need any correction? These are important questions. The possibility exists that estranged brothers in Christ - still far more alike in doctrine than different - might finally be reconciled around the table of the Word of Christ. I think a Banjo Summit would be a light-hearted way of showing a sincere-hearted desire to talk. First, it thrills me to think that the LCMS and WELS may soon sit down together, not just for banjo playing, but especially to discuss their doctrinal differences in the light of Scripture and the Confessions. My impression is that the Confessional in the two synods are not as far apart as it might seem. With wonderful Confessional leaders like Schroeder and Harrison, I have great hopes for the future of Confessional Lutheranism in America. Second, might the Intrepid Lutherans consider writing a series of articles on Thrivent? My impression is that a large number of WELS members are extremely uncomfortable with Thrivent, but almost all are afraid to speak out against the sacred cow in public. There almost seems to be an unspoken rule that says, "Yeah, we all know Thrivent's no good, but it'll cause a ruckus and cost us money, so we're not gonna say anything." I would be interested in a Scriptural analysis of our relationship with Thrivent. May I second the Scriptural analysis of Thrivent? Yep on the banjo/guitar summit. Objectively speaking, ELCA ceased to be an identifiably Lutheran church when it entered into formal altar and pulpit fellowship with various liberal Reformed churches, on Reformed terms. Since then it has been what we have always called a "Union church." "Lutheranism" in some form is perhaps still one school of thought among many in the large conglomerated ecumenical ecclesial "thing" that ELCA now belongs to, by virtue of its official ties with the United Church of Christ, the Reformed Church in America, the Presbyterian Church USA, the Moravian Church, the Episcopal Church, and most recently the United Methodist Church. But ELCA as such is not a Lutheran Church by any objective, historical, theological definition of Lutheranism. It is, as I said, now a Union church. Its embracing of homosexuality does not place it outside of Lutheranism, since it was already outside of Lutheranism. Its embracing of homosexuality goes further than this, by placing it outside of natural law and common human morality. You guys really want us to be burned at the stake, huh? Remember, we Intrepids are all in this together. The truth can be a pesky thing. Light me up too! Thanks for your thoughts on the Harrison/Schroeder summit. I just posed the question because we have to be careful. Yes, the LCMS has change in 50 years and so have we. But, as the last LCMS convention demonstrated - the same convention that elected Harrison - the issues resulting in the split between us still exist. "Cooperation in Externals" was one of the major issues that led to the split between WELS and LCMS. Look at Resolution 3-03, which was affirmed at the 2010 convention 961-175. The elephant that was in the room in the 60's is still in the room in 2010. This is even more surprising considering the status of the ELCA today. I am not saying that this should prevent us from talking, no - we should! But let us also be prayerfully realistic. This issues that divided us in the 60's are far from being addressed, especially with the overwhelming support for the resolution. Regarding IL taking on Thrivent. Do it! I am not ashamed to publicly call our relationship with Thrivent questionable at best. I fall short of calling it a sinful because there is so much I do not know about the situation. But it is bad, an albatross around our necks, a temptation to trust in mammon instead of the Lord to provide, and a sign of our fear instead of our faith. Other than receiving money (and getting books from the Seminary Book store) I see no benefit from our relationship with Thrivent. I wish our synod would test the LORD in faith, break ties with the organization and see whether or not the LORD would not pour down his blessings upon us as we look to him, and not Thrivent, for help in our time of need. PS: This email was brought to you by Thrivent for Lutherans. Support your congregation and spread the Gospel by becoming a Thrivent member. All member donations are matched for specific Church Growth projects of which we decide the merit. Invest in Thrivent. Let's Thrive. PPS. If the above post script seems inappropriate for an email, imagine how inappropriate it is to be in the bulletin used for the Divine Service. Notice that the the forth "Whereas" is a reaffirmation of the 60's statement on fellowship composed right around the time of the split. The wall that divides us is, sadly, still standing. Thrivent will surely have its day on IL, and we appreciate those who are willing to be "lit up" alongside us. We're not really afraid of the stake. We'll just have to decide which are the biggest fish and be sure to get them on the fryer. Pietism among us has not yet reached that golden brown color of doneness. As to Missouri's continual insistence on working with ELCA, I can't understand it for the life of me. A synod of over 2 million members should be able to do all the humanitarian undertakings they want without having to lock arms with an apostate synod, as if God had no other way of seeing to the needs of mankind. I would really appreciate it if any of our confessional brothers in the LCMS could shed some light on this. How do you react to this recent synodical resolution? How do you deal with it? Disclaimer: Yes, I have family members (WELS & non-Wels) that work at Thrivent & I have a policy there. One day I opened up the magazine, and realized there was a "devotion" in there from an ELCA pastor. A light bulb clicked on and I thought why is my previous WELS congregation promoting Thrivent when it is sending religious material from ELCA and such. For weeks our church had been encouraging Thrivent members to fill out the forms for matching donations and asking others to pay $10 to become associate members without any warnings about the religious mailings they would send out. I asked a Pastor in Bible Class (even though 2/3 of our church members (give or take) work at Thrivent and many were in that Bible Class). He said that we need to be careful because "although they don't have their own doctrinal statements like a church, sometimes it seems that Thrivent acts like a church, when it is not". I would agree. I never thought about all the AAL stuff when I was a kid, it was everywhere: the meetings at church, the cups & napkins at donut hour, the crosses handed out at confirmation- great marketing strategy for AAL. One year in High school band, I played religious songs with the AAL choir (a paid gig!) for their Christmas party. I am 99% sure that they even had a prayer together with all employees before the meal. When I turned 18, I got insurance at the instance of my parents and of course turned to our local AAL rep.
As a teen or young adult, I really thought that everyone working there was Lutheran and mostly WELS (until my unchurched relative started working there. I loved the free stuff and only got books by Concordia or NPH per my mother's advisement. True, Thrivent is a business and we accept donations from other employers who are not religious but because of the heavy presence in the church they became more like an extension of the church, not a separate business entity. B. While inviting, encouraging & promoting membership, there wasn't a warning advising people that they may send out freebies that disagree with our doctrine. C. Local congregation advertised for them in our bulletins and other churchware items with their name on it so heavily that again they became an extension of the church. D.They support the Salvation Army kettle drives with matching funds and Habitat for Humanity. They strongly encourage their employees to ring bells and build homes for these organizations. I've seen WELS Thrivent employees join in these activities. E. Similarly, we have issues with the Scouts. I've heard LCMS allows scouts as long as they don't join in the National chapter events and have their own club at church with LCMS members as leaders. WELS has discouraged this creating Pioneer programing. Except for the fact that Thrivent doesn't have a written belief statement, it is similar. Our WELS churches have allowed a separate branches of local WELS congregations led by its members even though Thrivent's connected with other church bodies. I can see why the LCCF is against Thrivent http://lutheranlccf.org/WhatWeBelieve.html. Personally, I think may be fine for a WELS member to have a policy there or work there as long as it doesn't cause someone to be in a position or participate in events that would cause them to break doctrinal values of fellowship. If working there would cause such a conflict then they should leave, just as any other non-religious affiliated workplace setting. I value our fellowship doctrine as a way to keep false doctrine our of our church and homes. I think our church's relationship with Thrivent puts members in a position to allow them to compromise the stance they should have regarding fellowship with other churches. I also don't think our fellowship doctrine is "taught" enough in church, or that many members understand it thoroughly. It seems to have been shoved under the rug because it gave WELS such a bad rap (WELS is snobby). I feel blessed to be a member of a church body that adheres to the Bible and takes such a strong stance, at least in writing. We should be educating our members on what a blessing it is to have such a doctrine rather than viewing it as hindrance for church growth or money to support the congregation. It is unfortunate that we in the LC-MS have many (too many, if one asks me) entangling alliances with "joint ministries" with ELCA. Lutheran World Relief is one of those "ministries". My congregation does a lot of collecting items for LWR for health kits and school kits. Is my congregation ready to hear about ending ties for LWR? Probably not right now. Is the Missouri Synod ready to hear about ending entangling alliances with ELCA? Probably not right now. In time? Yes. Please allow my synod a little bit of time to disentangle herself from a myriad of problems. It's not going to happen in an instant. President Harrison's first column in The Lutheran Witness on Repentance is a good start. A good dose of repentance never hurts. Speaking for myself, I'm glad to encounter pastors in the LCMS who recognize the problem and are working toward a solution. I consider them my confessional brothers. It's those who defend and promote error whom I cannot consider to be confessional. May God grant his Spirit of wisdom and truth to Pres. Harrison, and may God also prosper his Word in the LCMS and grant Pres. Harrison a synod that is willing to be led.